There is more webkinz than you can imagine. There are all kinds of different animals that your kids can choose from. No matter what kind of animal they like they will be able to find one that they can shower with love. They will have endless fun with their new pets and be able to take care of them. Every kid wants to have a best friend that wants to do everything with them. With the webkinz pets they will have exactly that. However, there is more to webkinz pets than just the plush animals. When your kid receives their new webkinz they will be given a secret code that they can use online to adopt their pets. They will be able to pick out a name for them and even choose whether they are a girl or boy. This way they can have the best friend that they always dreamed of. They will also be able to go online to the webkinz site to care for their pet. They can have hours of endless fun with them. On the website they will be able to design a room for their new pet. They will be given kinzcash that they can use to buy new furniture and other things for their new pet's room. They can find out when they are hungry, happy and what their health is. They will have the chance to play games, do trivia questions, enter contests and a lot of other things that will not only teach them things like responsibility but that they can have fun doing with their best friend. They will be begging their parents to let them get online to play with and have fun with their new webkinz. Parents will be able to get online and monitor what their kids are doing on the webkinz site. They will be able to keep control of what their kids are allowed to do. This is something that is important for every parent so that they know their kids are safe. Another thing that parents like is the fact that the webkinz will help their kids learn how to be responsible for something other than themselves. This is always something that parents are trying to teach their kids. With webkinz pets your job as a parent will be much easier. This is something that every parent likes. Parents also like to see their kids having fun and learning at the same time. Not many toys will be able to accomplish both of those things at the same time. Webkinz is great because they have combined the two and made a great place for kids. They have come up with a very inventive way for the kids to enjoy themselves and for parents to be happy about them spending time online. Not many websites can boast that they make kids and parents happy at the same time. Usually it is just one or the other but not both. You need to buy a webkinz for your kids right now. The faster they get their webkinz the faster they can start having fun and learning. You and your kids can sit down and spend time together when you are showing them everything that they can do with their new pet. Your kids will love you forever. You definitely want to see your kids happy and to see them getting more education. What is better than them getting the education of responsibility that will help them throughout their whole life? There are more webkinz then you will ever be able to buy for your kids but letting them get one will make you and them happy. So go get one today. Summary: The more webkinz you see the more you will love them. They are a great educational toy for your kids. There are also a lot of reasons that parents like them. 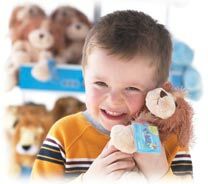 This is one plush animal that makes both the kids and the parents happy. What could be better than that?